NEW YORK, Jul. 19 /CSRwire/ - Creative approaches to advance the 17 Sustainable Development Goals (SDGs) are being jointly developed at the national level by multi-stakeholder partners. That was the key take away from SDG Country Plans: A Roadmap to Private Investment, an event organized on the sidelines of the High-level Political Forum by the United Nations Global Compact, the Principles for Responsible Investment (PRI), the United Nations Environment Programme Finance Initiative (UNEP FI), the United Nations Economic Commission for Latin America and the Caribbean (ECLAC) and the Permanent Missions of Ecuador, Egypt and Spain. The event marked the next step in an important and ongoing conversation about breaking down silos and connecting Governments, business, investors and the UN on the increasingly critical topic of financing for the SDGs. Representatives from Government, business, investor groups, the UN and Global Compact Local Networks relayed lessons learned and best practices, opening up new dialogues and approaches to advance the SDGs at the national level. In particular, Governments and investors agreed about the need to align private investments with SDG country plans. Luis Fidel Yáñez, Officer-in-Charge at ECLAC, underscored the importance of all actors aligning strategies on SDG targets and indicators to maximize impact. “A multi-stakeholder approach is the key to success. All key players must be engaged to implement the 2030 Agenda. We depend on this kind of strong partnership,” said Yáñez. Throughout the event, the role and work of Global Compact Local Networks as the initiator of dialogues and a convenor of diverse stakeholders was frequently returned to. Mauricio López, Executive Director of Global Compact Network Colombia and Vice President, of ANDESCO, described how the Local Network works to enhance relationships between all stakeholders. “We worked every day on spreading knowledge about the SDGs. I went to 96 conferences evangelizing the SDGs; and we became the natural body for the Government to implement the SDGs. Working together builds trust. We will have to build a language and indicators for the private sector to deal with the Global Goals,” he said. During the discussion, it became clear that Governments play a crucial role in making the SDGs relevant to all stakeholders, including business, investor groups, civil society and local communities. One example from the state of Paraná in Brazil stood out. The local government in Paraná have decided that all government money spent on procurement should go to companies that have an SDG strategy. Silvio Barros, Secretary of State of Paraná, explained the Government’s decision like this: “All the states’ investments are tied to specific Goals. We are also directing all the purchasing power of the state to companies and investments, that are tied to the Goals. Actually, we do not see any reasons why we should spend public money in companies that are not supportive of the [Ten Principles of the] UN Global Compact and the SDGs. We can direct our purchasing power to the achievement of the 2030 Agenda,” said Barros. At the event, UN Global Compact launched a new report, Global Compact Local Networks: Accelerating National SDG Implementation, showcasing how Local Networks can help drive action and collaboration to close the gaps between where we currently are and where we need to be by 2030, the deadline for achieving the SDGs. The second panel at SDG Country Plans focused on mobilizing private capital for sustainable business, and engaged a high-level panel of Government officials and representatives from the financial sector. H.E Saher Naser, Minister of International Cooperation and Investment in Egypt, described a range of initiatives and incentives taken by the Egyptian Government to attract more private capital. “We have various kinds of awards and different incentive packages to ensure that the private sector can play role in achieving the SDGs. We need private investments alongside the Government, and it’s important to get the international financial institution community on board, so it’s not only the local finance sector and Government who invest with SDGs in mind,” said Naser. H.E. Phillip Fox Gough, Minister Counsellor, Government of Brazil, opened the discussion about how Governments can improve their communication on the Voluntary National Reviews (VNRs) to the investor community. “There [are] a lot of interesting elements in the VNRs, but they are not communicated well. We are saying a lot of good things about what Governments do. It would be useful for investors if we focused a lot on identifying the gaps and challenges,” he said. 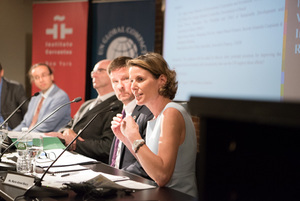 The interest from the financial sector in measuring the impact of investments was clear. Gavin Power, Executive Vice President and Chief of Sustainable Development and International Affairs at PIMCO, talked about the interest of investors in investing in the SDGs at the country level and highlighted the need for government to better define and package investment opportunities for the markets. Maria-Aimee Boury, Managing Director, Impact Based Finance at Societe Generale Corporate and Investment Banking, talked about the need for a stable policy environment for investors. “The key for us when we make a decision is the predictability. We would like to see the same level of commitment and predictability from the Governments and the municipalities into the project they have chosen as their priority. Governments need to commit to facilitate, which also means fast tracking, giving information and pushing for the projects, and continuing also if the Government changes,” said Boury, who also suggested optimistically that the private investments needed to advance the SDGs are actually within reach. Before the event at the Spanish language and cultural centre Instituto Cervantes, the UN Global Compact hosted a well-attended lunch for representatives from the Group of G77 and China in order to update them on how Global Compact Local Networks have been mobilizing the private sector and UN system at the local level to help advance national priorities.